'Tis the season! MOTÖRHEAD is giving thanks to fans by offering up a killer new prize via CraveOnline.com. 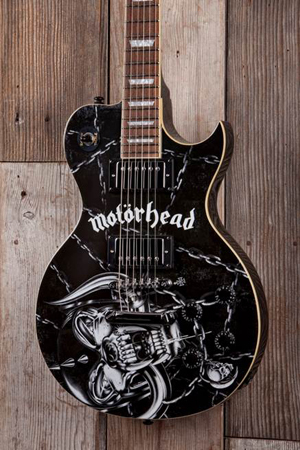 Fans can enter to win a brand new, limited edition collector’s model of the ASG MOTÖRHEAD guitar (pictured below), which is currently sold out through ASG. Learn more about the guitar and enter to win at CraveOnline.com now. The new music video for the track "Heartbreaker" debuted in October and can be viewed HERE. Take a look! The video is produced by EPIGRAPHICS and features animated sketch art drawn by the man himself, Lemmy Kilmister. The video also features special live footage taken at several of the band’s recent top performances at the Metal Hammer Golden Gods, Wacked Open Air, Rock In Rio, and more.